Partners in Design released the third block in the Sew Let’s Quilt Along. It is a ruler block, and is a bit of a challenge to piece. I am not a great piecer, so this fun and challenging block was good for me to make. The numbers are not stitched down yet; I hope to get to that soon. Otherwise, this block is done and I am happy with it! Back in January, I announced that I was going to make an art quilt. I hadn’t made one in such a long time, and this one has been on my heart for a few years. And then I didn’t do anything with it. I got out the tracing paper and finally traced a working pattern. I might redraw the face; not really happy with it, but changes will be made as I go along. That’s part of the process. Partners in Design is offering a free QAL called Sew Lets Quilt. The first block was a sewing machine, and you can see my version here. I am one block behind in this QAL, but I am okay with that. The blocks have been easy to piece, and an enjoyable way to spend a little time. I think the third block will be a bit of a piecing challenge, but I am up for it. Back in October 2016, Lorna, at Sew Fresh Quilts, designed and hosted the MOD Bear Paw QAL. I fell in love with her quilt, and had to have it, so I joined in the fun. I am happy to say that I have finally finished the quilt! I am so happy to say that most of the snow is now gone, and look what has replaced it! Work hours have increased; it is time to get outside and play in the garden; and I do have vacation time coming. It is a lot to pack into the month. So, I am going to keep this month’s OMG very simple, but even so, I am not sure that I can complete it. I purchased this cute llama print a couple of months ago (or so). When I get home from work, I love to get comfy in a t-shirt and pajama bottoms, so I intended to make pajamas with it. I have the pieces cut out…all two of them. Ha, ha! Not even any pockets! What is your OMG for April? 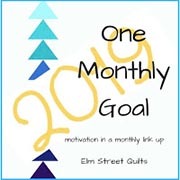 Let’s all link up with OMG at Elm Street Quilts. We can inspire and support one another as we work on our projects!